Netflix, the world’s leading internet TV network, will bring the ten-episode series The Umbrella Academy to members worldwide in 2018. 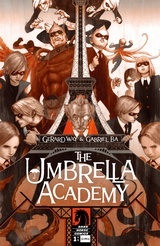 Based on the popular, Eisner award-winning comics and graphic novels created and written by Gerard Way (My Chemical Romance) and illustrated by Gabriel Bá, The Umbrella Academy is a live action series that follows the estranged members of a dysfunctional family of superheroes (The Umbrella Academy) -- The Monocle, Spaceboy, The Kraken, The Rumor, The Séance, Number Five, The Horror, and The White Violin -- as they work together to solve their father’s mysterious death while coming apart at the seams due to their divergent personalities and abilities. Published by Dark Horse Comics, the comic series garnered much praise from fans and critics alike for its alternate and twisted take on the superhero genre.